A friend of mine, upon learning that I live by myself, made the claim that I either had to: a) lose some part of my sanity, b) develop a coping mechanism, or c) find some strange hobby, in exchange for my solitary living situation. He was of the mind that only eccentrics live by themselves, and that by choosing to live by myself, somewhere along the way I have unwittingly sacrificed a part of my facade of 'normal behaviour'. Of course I denied everything, distancing myself from his crazy theory, particularly option A, as hastily as I could. That of course left me with options B and C which, if you stretch it, aren't really that far removed from option A. Thinking about it though and looking back on the things that have happened since moving out (the first time), it turns out that the guy wasn't completely wrong. So with that last bullet point, I didn't actually develop cooking skills after moving out, but before that moment cooking always felt like a chore. Now though, it feels more like something I need to perfect; a skill I need to improve and which I really enjoy doing so. The dinner I made for myself tonight is one such example. Throughout the pizza-creation process, I read-aloud the pizza base instructions that I've pretty much already memorized, and sang-along to whatever music was playing through my TV/Xbox. And after putting the pizza into the oven, I was so excited about it that I told the world via Twitter. The verdict? I need to work on the cheese-stuffed crust part of it - I either didn't use enough cheese or the right kind of cheese because what I had inside the crusts melted and thinned-out, leaving a not-very-cheesy hollow crust - but everything else was exactly how I liked it. 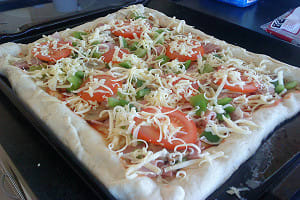 A quick internet search has given me some ideas to try for Pizza 2.0 (use mozarella cheese, or cheese strings), but today has really illustrated just how right my friend was about what has happened to me since living on my own... and here I am blogging about it.